A century of road safety – all packed into a one-hour webinar! The Safe System approach to road safety is the cornerstone to network improvements around the world including through the work of the International Road Assessment Programme (iRAP). 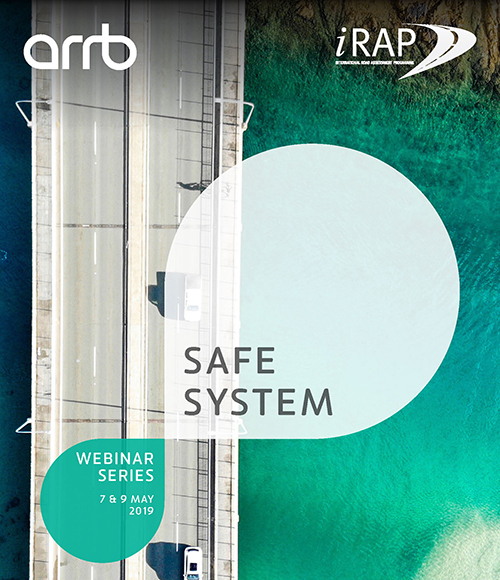 Purpose: This webinar – a joint venture between iRAP and the Australian Road Research Board (ARRB) – will provide an intriguing summary of the road safety story. it will be co-presented by Greg Smith (iRAP) and Paul Hillier (ARRB). It will be a lively, fast moving session, with opportunity for delegates to provide comment and ask questions. There will also be a second follow-up webinar. It will largely be a discussion forum, where the two experts will be available to answer previously tabled and live prompted questions. Would you like to hear from us more to get the big picture on iRAP’s latest work in promoting and creating safer roads worldwide? WrapUp, our free bi-monthly digital newsletter is just what you need. It’s packed with inspirational stories about the life-saving work of our partners around the world. Using specially equipped vehicles, software and trained personnel, iRAP Inspections involve detailed road surveys and data collection. These focus on more than 50 different road attributes that are known to influence the likelihood of a crash and its severity. These attributes include intersection design, the number of lanes and markings, roadside hazards, footpaths and bicycle facilities. The road inspection data underpins iRAP Star Ratings and Safer Road Investment Plans. 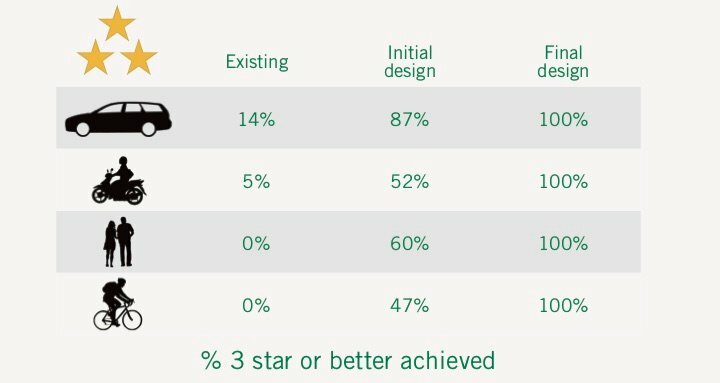 The risk reduction design improvements proposed in a Safer Road Investment Plan can be adjusted by local experts to improve the Star Ratings for different user groups. iRAP recommends that all new roads should be built to a 3-star or better rating and all existing roads upgraded to that level. The 3-star or better minimum can be achieved through a combination of infrastructure improvements and speed management initiatives to ensure a minimum level of safety for all road users at the location. On high volume roads, 4 and 5-star targets are often justified for specific road user groups (e.g. 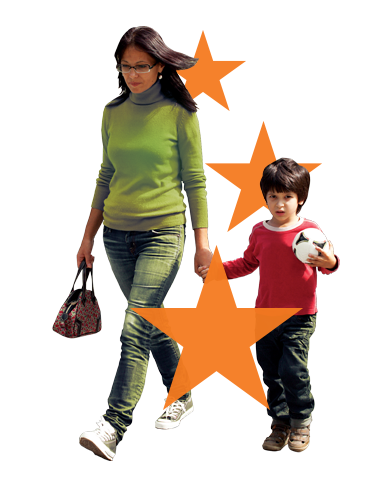 5-star for pedestrians in CBD areas; 4-star or better motorways for vehicle occupants). Designers managed to boost significantly the length of road rated 3-stars or better during the building of the US$323 million World Bank-financed Second Gujarat State Highway. They used a range of safety countermeasures including traffic calming, pedestrian footpaths and crossings and street lighting to ensure that the characteristic ‘green tunnels’ of old roadside trees could be retained while mitigating their safety risk. Do you manage, design, build or maintain roads? iRAP is an international leader in providing policy, investment and performance tracking tools for road executives, managers, engineers, designers and construction teams to build and maintain safer roads. We work worldwide with road management professionals to deliver safer roads for today and for the future. Roads that build-in safety. Roads that deliver safer journeys for all users. Safer roads that save money! A win-win-win for all. Safer roads are becoming the new policy norm for investors and development agencies worldwide. This creates exciting opportunities for roads professionals and the road safety community to work together to save lives. Building all new roads to a 3-star or better standard for all road users saves lives and makes great business sense. Upgrading existing roads to maximise travel on 3-star or better roads is also practical, cost-effective and starts saving lives right away. 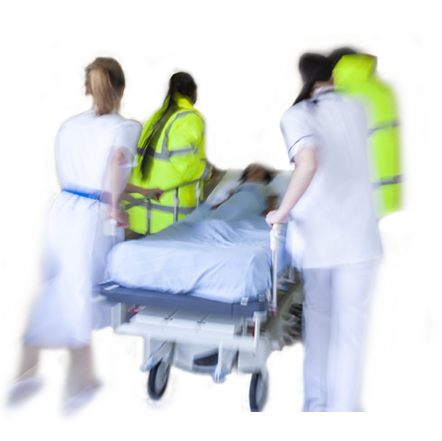 iRAP provides the business case for investment and the tools to maximise lives saved. Let’s work together to create a safer, better world! We need a strong policy framework and ambitious global targets if we are to deliver safer roads that save people’s lives. iRAP and its partners are working with international bodies, national governments and highways agencies to build a global policy consensus for safer roads. In 2015, the United Nations included halving road deaths and serious injuries as a Sustainable Development Goal (3.6). This game-changing move put road deaths centre stage – where they belong – as a global development issue, alongside poverty reduction targets and the right to clean water. Now, the challenge is to build on this momentum. The UN Secretary General has recommended all new roads should be built to a 3-star or better standard and existing roads upgraded. The establishment of a Safer Roads Fund to maximise travel on 3-star or better roads can provide international finance institutions, health organisations, treasury officials, road executives and road builders with the social and economic basis for safer, sustainable roads. Let’s work together to create a world free of high-risk roads and save lives! Road deaths and serious injuries are an international public health crisis. Every year, around 1.2 million people are killed on the world’s roads and around 30-50,000,000 people are injured. Road crashes are the leading cause of death for young people aged between 15-29 years. Road crashes cost an estimated 2-5% of GDP in each and every country worldwide. Like other global health problems the Vaccines for Roads exist and it is just a question of the scale of our response. iRAP is working to support the scaling up of action worldwide and reduce this tragic toll by enabling low-cost infrastructure solutions that make our roads safer. Safer roads also make sound business sense. Dollar for dollar, safer roads provide one of the highest possible, job-creating public investments a country can make in health and infrastructure policy. We want safer roads for all road users: pedestrians, bicyclists, motorcyclists and vehicle occupants. Safe roads are a social justice, health and economic issue. In poorer communities, in particular, road traffic crashes can have catastrophic effects that tip families into poverty and destitution. The road improvement programmes we enable make your roads safer. Because every road environment – and the community it serves – is unique, each life-saving plan we develop is unique too! iRAP is at the cutting edge of bespoke solutions for safer mobility worldwide, regardless of how you move from A to B. Our work is making roads safer for you and your families, your community and your company. The Star Rating of a Road Design can be completed as a stand-alone activity. 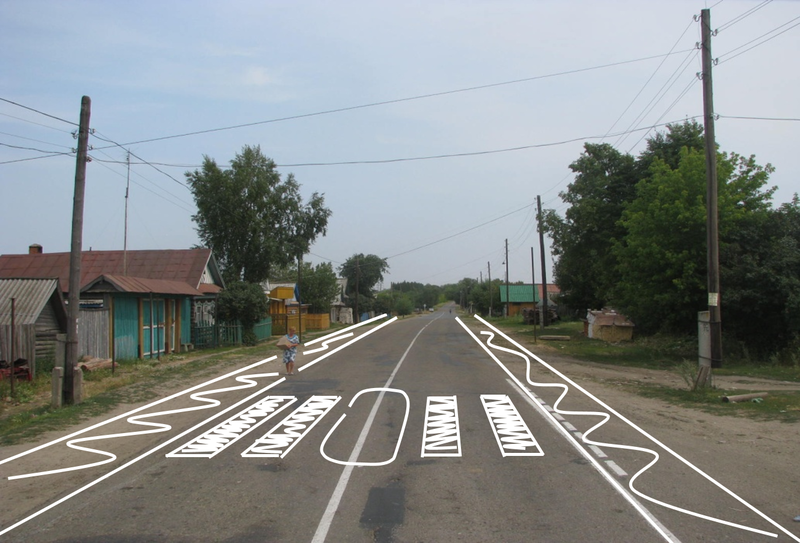 The process is being used by road agencies, development banks and design consultants to objecitvely specify and measure the safety of a road design for all road users. 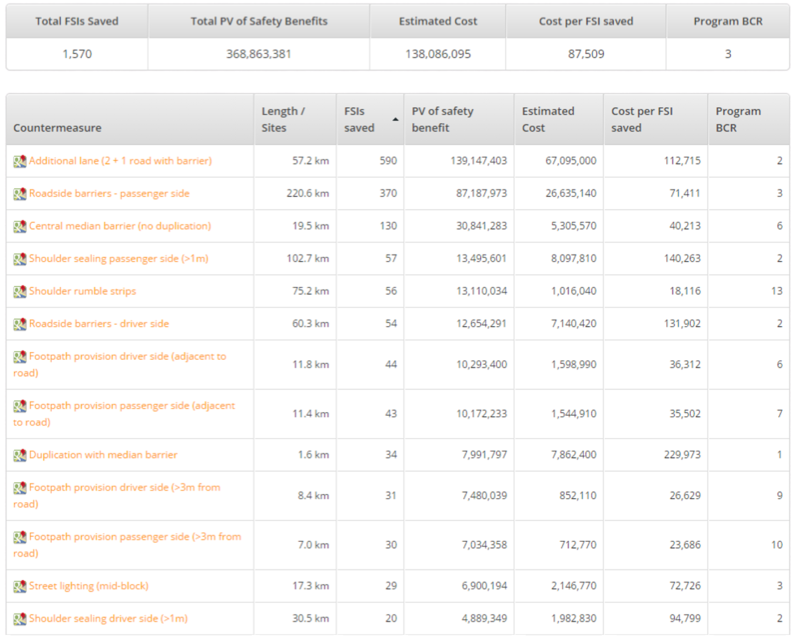 The process offers an opportunity for road owners to set a performance based star rating target for all road users (e.g. the new road must be minimum 4-star standard for pedestrians and cyclists and minimum 3-star standard for motorcyclists and vehicle occupants). It has been successfully used in conjunction with existing mechanisms such as Road Safety Audits and compliance with road design standards. The impact on risk of various design iterations can also be explored to help harness the potential of designers to find creative solutions to challenging safety problems. 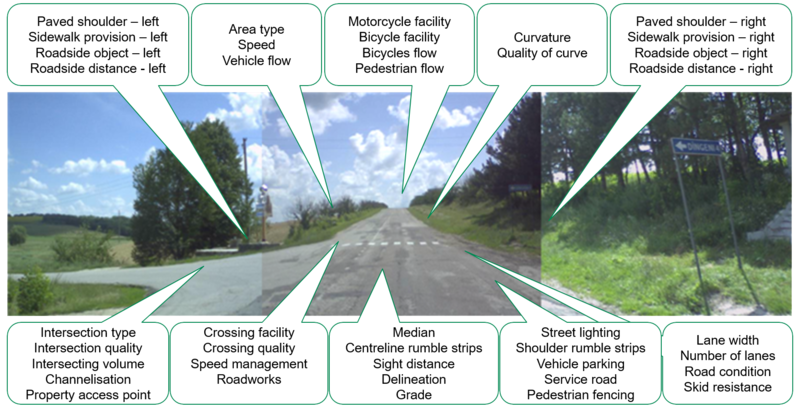 Here is a visual representation of some of the key road infrastructure features that are assessed during a typical roads inspection. 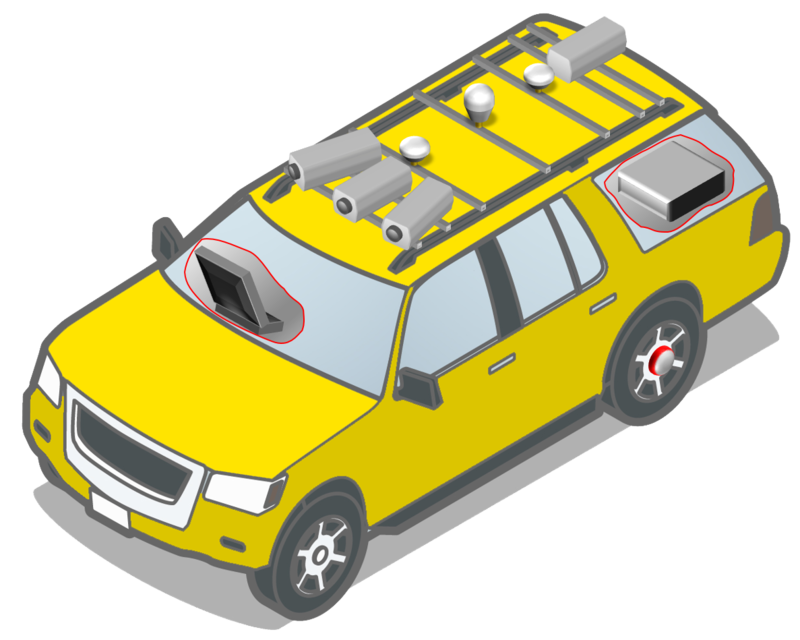 The inspection identifies levels of risk for all road users. By adding key infrastructure elements such as footpaths and street lighting or improving existing elements to reduce risk we can make roads safer for all road users. 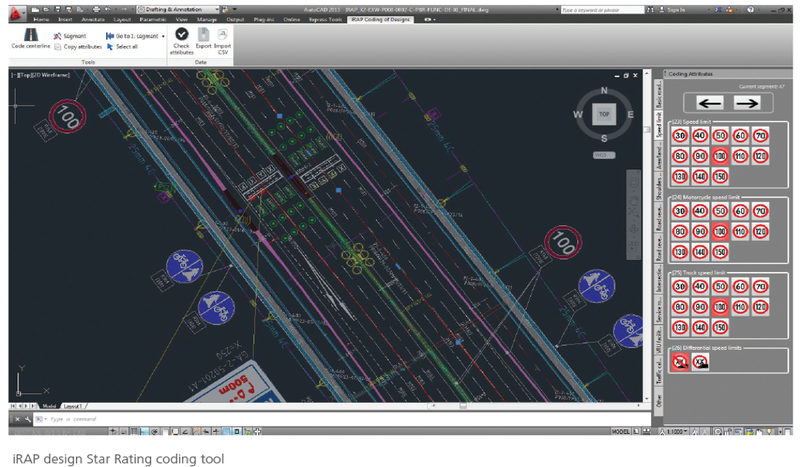 Trained staff code the road attributes in 100 metre intervals and upload data into ViDA in an Excel.csv format under supervision from a suitably qualified iRAP partner or supplier. 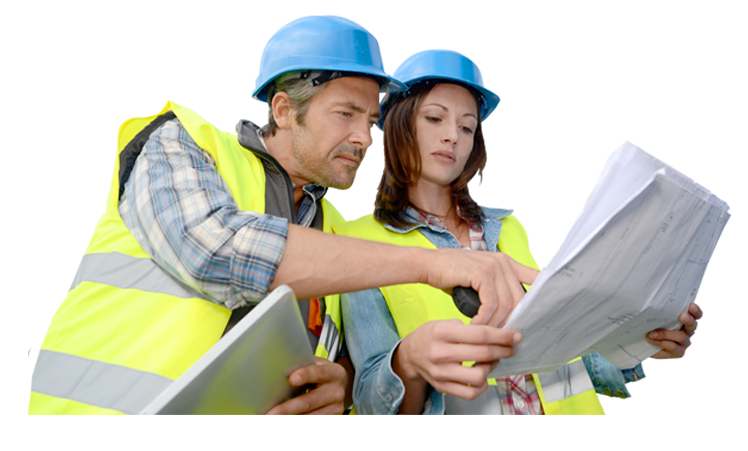 To ensure high standards of accuracy, the team undertaking the coding is required to give a weekly report which shows the level of accuracy for each road attribute. 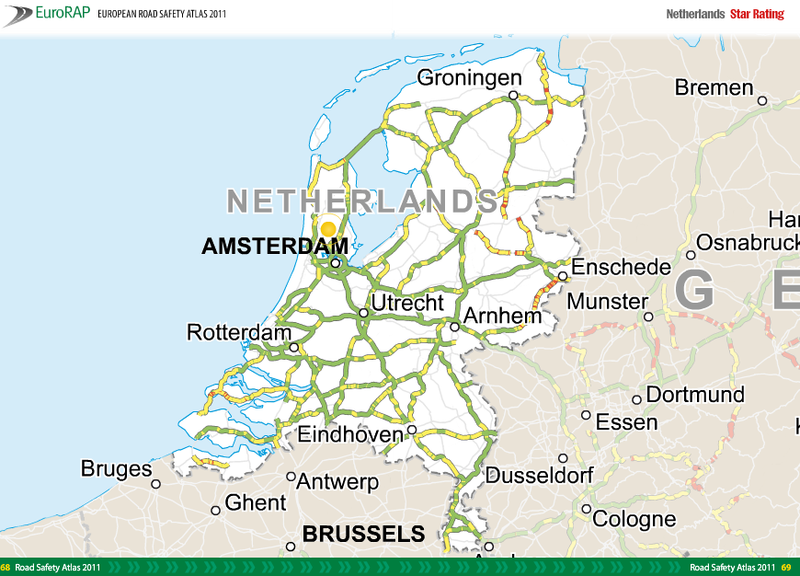 Where a road agency already has data available (e.g. asset management register) this information can simplify the coding exercise and ensure good integration with existing systems. 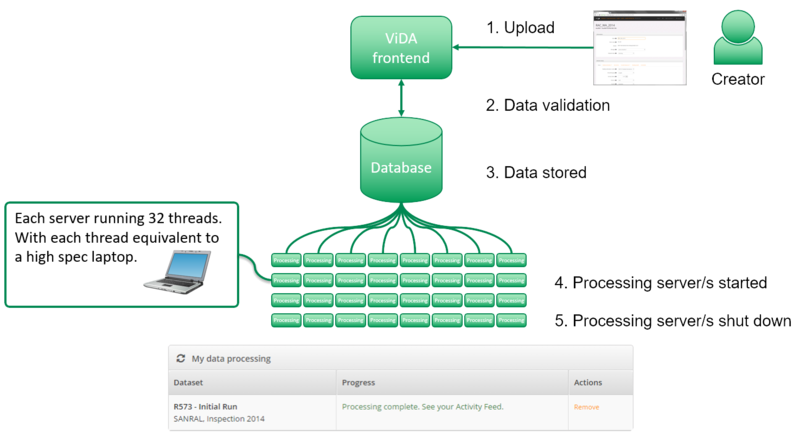 The raw data is processed in ViDA to create data reports about a road’s design and the level of risk for each road user group. ViDA is capable of performing risk and economic calculations for millions of kilometres of road. All data is securely stored and project teams can determine who has access to results. Processed road inspection data is used to develop Star Rating maps. The five-colour maps provide a simple and objective measure of the level of safety which is built-in to the road. Five-star roads are the safest while one-star roads are the least safe. The internationally recognised colour coding system ensures a better understanding and awareness of why some roads are safer than others. A Safer Road Investment Plan is produced that makes the business case for investing in road infrastructure safety. The plans list a range of life-saving measures that could be used to improve a road’s Star Rating and reduce fatalities and serious injuries. The International Road Federation has developed a series of Road Safety Seminars (Safer Roads by Design™) to provide road authorities with best practices and latest technologies that can be implemented to meet a country’s commitment to the Decade of Action. Safer Roads by Design™ is an all-inclusive approach to road safety and includes seminars on the fundamentals of Road Safety, Roadside Safety, Work Zone Safety, Intersection/Roundabout Safety and Vulnerable User Safer. The University of Birmingham (UK) iRAP course in Road Safety introduces people to the iRAP technology for evaluating the safety impact of road infrastructure. The course includes practical exercises, discussions and exposure to the iRAP software. The course is delivered in the state-of-the-art teaching and learning facilities of the University of Birmingham. Enroll in the University of Birmingham course now. RAPcapacity online courses help people learn how to undertake iRAP-specification road assessments. Take an online RAPCapacity course now.